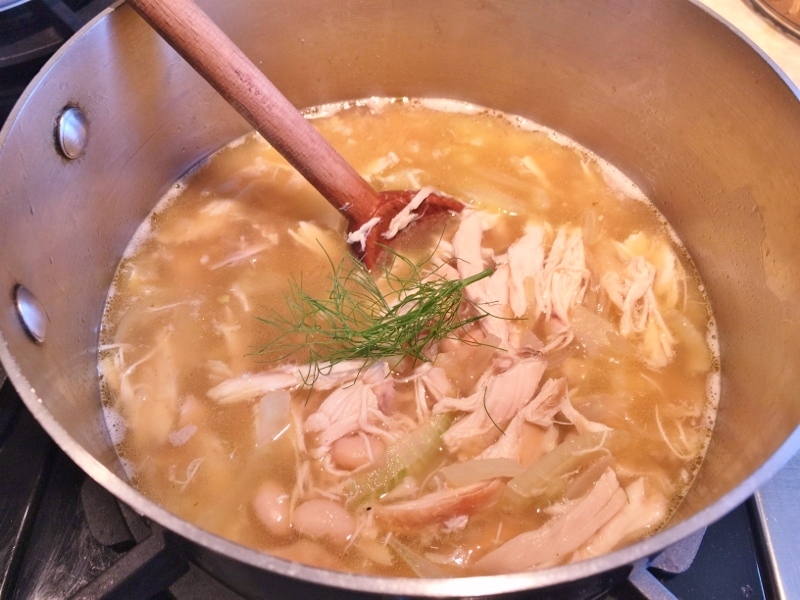 Rotisserie Chicken, White Bean and Caramelized Fennel Soup! - Live. Love. Laugh. Food. Chicken soup is inspiring, comforting and packed with things that are good for you and during the wintertime is just tastes so good. 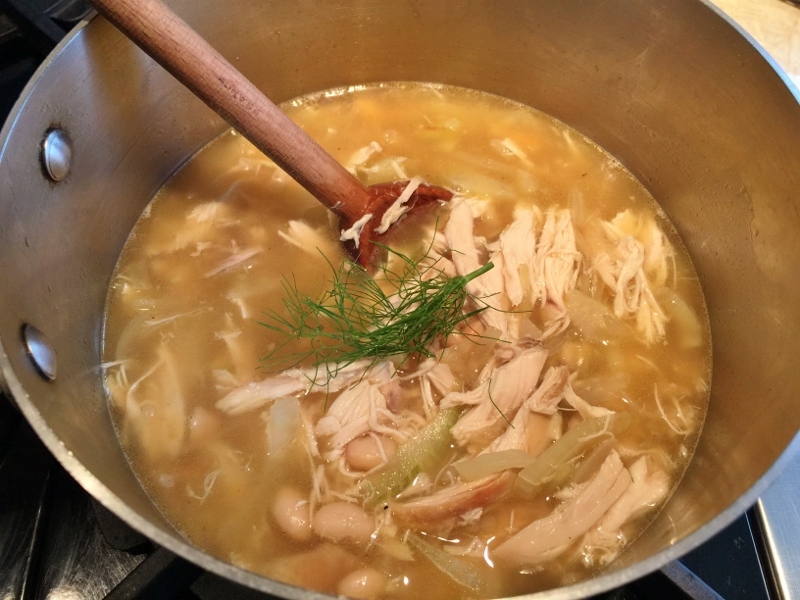 If you are feeling under the weather, chicken soup is the food of choice, but even if you’re not – this soup can be a bowl of complete satisfaction. Using a rotisserie chicken to prepare the broth, not only cuts down on time, but gives the soup a deeper flavor. 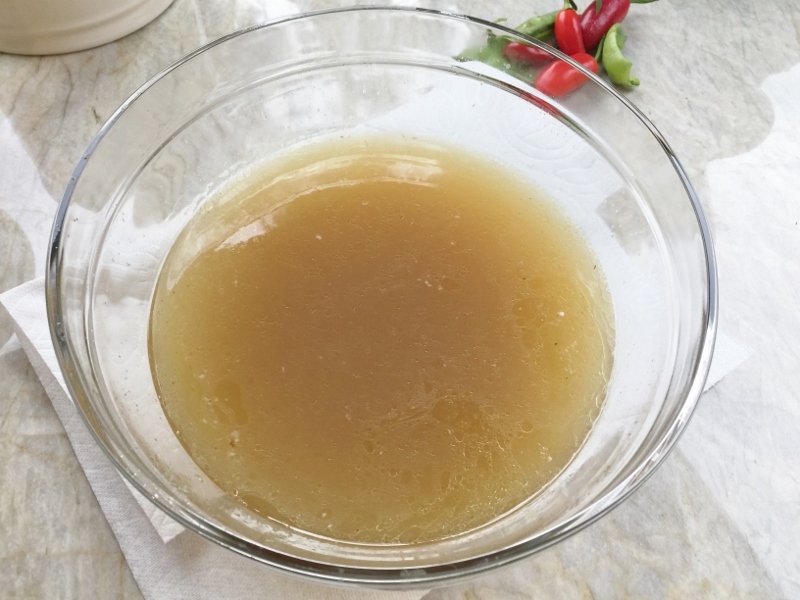 The cooked chicken bones create a rich decadent broth that surpasses any you can find in a box and the shreddable meat is succulent and ready to use. After the steamy broth has been made with the cooked chicken bones, the rest of the soup takes the plunge and is ready in no time. 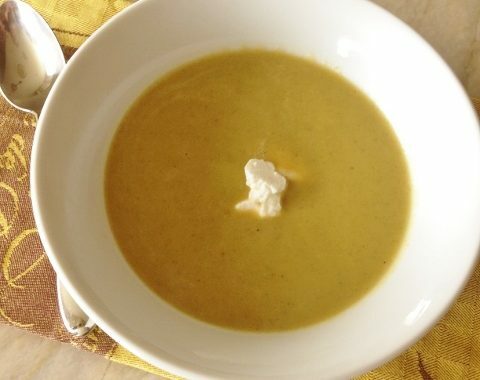 Caramelizing fennel turns this raw veg into a sweet companion and delightful when its incorporated into the soupy bath. If you think you are not a fennel person, give this a try. It’s definitely not like eating a raw bulb with a licorice bite. Ladle the soup in bowls and serve with a piece of rustic bread or crackers for dipping. 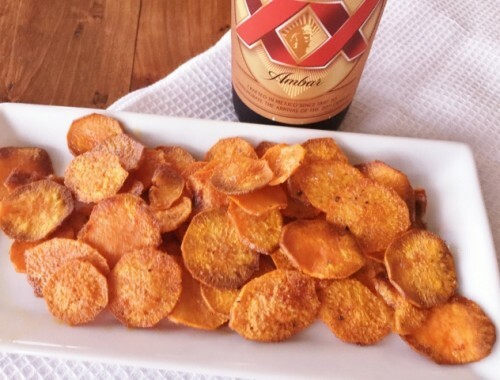 I believe this is one easy meal you will enjoy. 1. 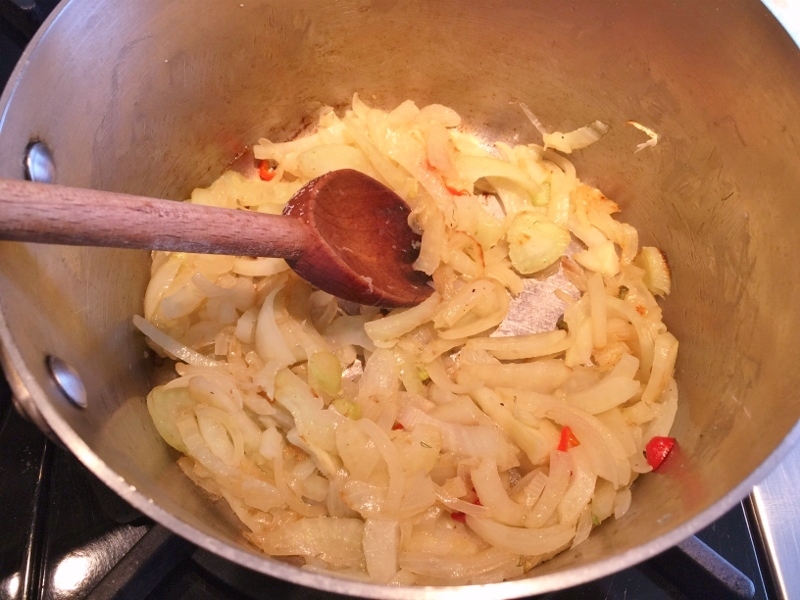 In a large pot, add chicken bones, onion, celery, salt, peppercorns and 6 cups of water. Place over medium high heat, until boiling then, turn heat down and simmer for 30 minutes. Strain broth through a mesh strainer and reserve. 2. In same pot, add 2 teaspoon olive oil, onion, chili and fennel. Cook for 15 minutes on medium low heat until lightly soft and caramelized. 3. 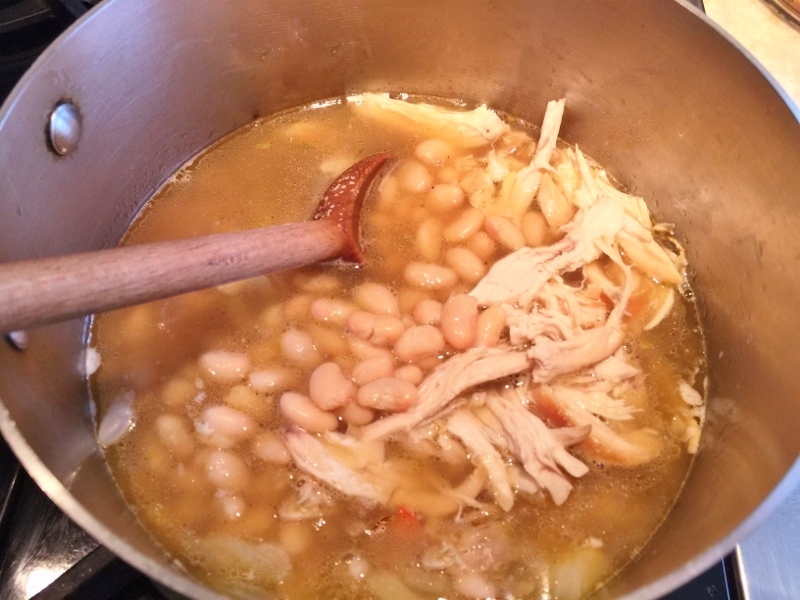 Pour in reserved broth, shredded chicken (reserving some for another use), salt and drained beans. Stir to combine and cover with lid ajar. 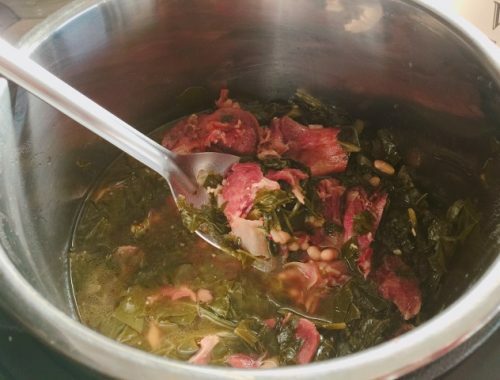 Cook soup over low heat for 15 minutes. 4. Ladle soup into bowls and top with a few fennel fronds. Enjoy! Chicken Soup Recipecooking with Gena BellEasy Soup RecipeHow to Make Chicken SoupRotisserie ChickenRotisserie Chicken RecipesSoup RecipesWhite Bean and Caramelized Fennel Soup - Recipe! Summer Broccoli Soup – Recipe!